The pile of T & T adventures I wrote in my teens. It all looks a bit too tidy doesn't it? Since my mum found a box of my T & T stuff she had tidied away after I went off to university, around September 1985, I have thought I would like to show some of it off. After more than 20 years in the attic it was all rather dusty and discoloured but considering its age in very good nick. The first thing that struck me was the sheer amount of it there was. Considering I only had two friends who played the game, and one of them not very often, I was amazed by the effort I had put in to the writing. 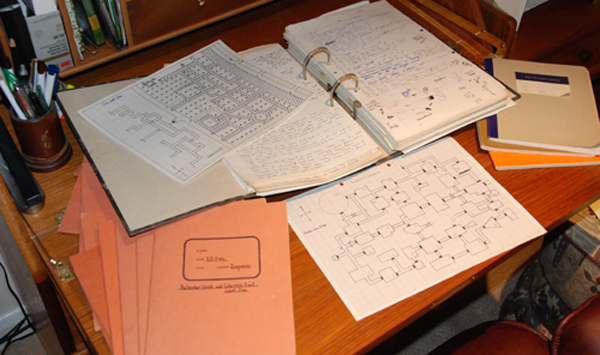 I must have been really tidy-minded back in the day as having produced a rough draft I would then copy each dungeon up into small exercise books using a fountain pen no less. 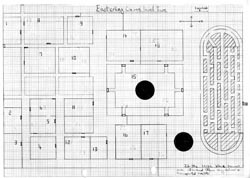 Having noted my proficiency in terms of the volume of material produced I seem to have been less than imaginitive in the sorts of challenges each dungeon complex would set any delver unfortunate enough to pass within their hallowed halls or abandoned caves. While a decent bit of "hack and slash" can be fun I cannot imagine how I thought books and books of it would continue to entertain. Despite being less than impressed with most of the the written content I was lucky enough to find all of the maps that I had drawn and I think they are really jolly good. 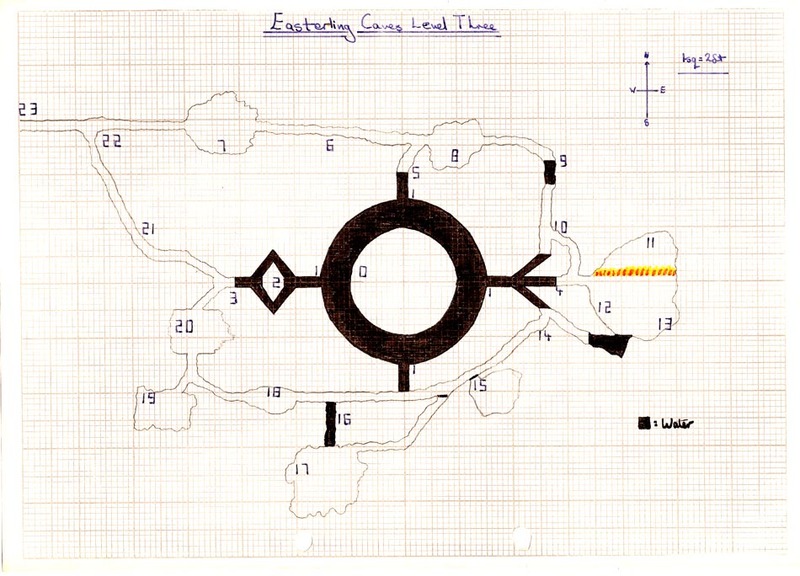 Therefore, I am going to let you see scanned images of the dungeon maps and just give a brief description of each adventure rather than scan hundreds of pages of my scrawly handwriting. 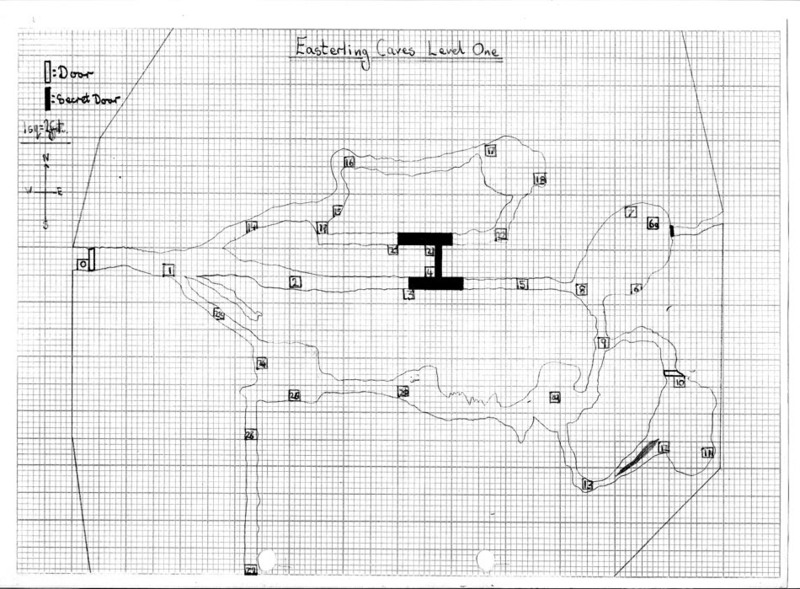 Easterling Caves Level 1. 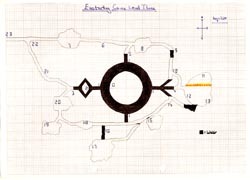 This is the the first dungeon I ever designed. It is just a cavern complex where any intrepid delver basically walks between opportunities to engage in combat with a number of monsters. It may be harsh on my 13 year-old self but this really did lack any sort of imagination. My fellow T & T players quite enjoyed the slaughter fest so perhaps I should relax. Easterling Caves Level 2. The second level is something of a contrast to the first one in terms of the plan at least. The actual content, however, is pretty much the same. Return to 'Hack and Slash' city. 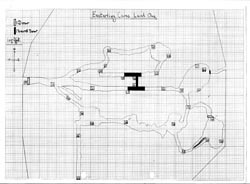 Easterling Caves Level 3. 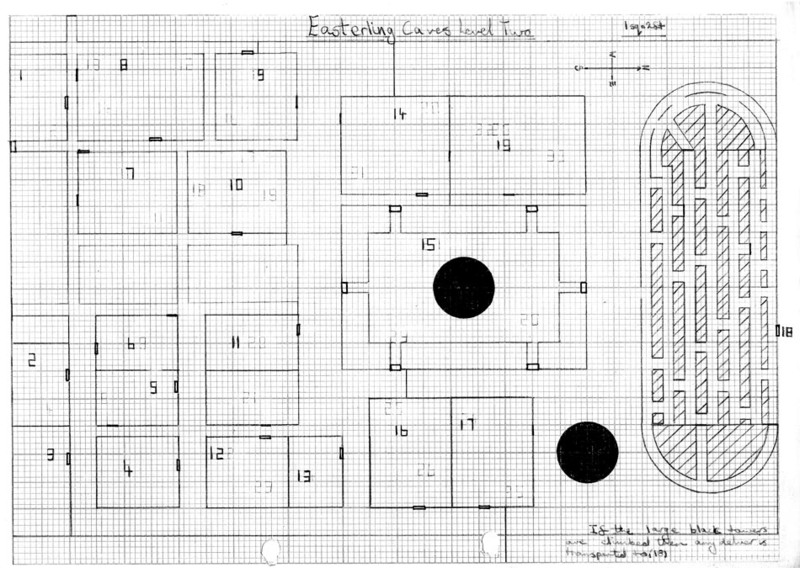 The third level is another interesting map complete with fire curtain and canals while the contents begin to show some tiny spark of the imagination. Not every encounter is bound to end in a fight and there might be a need for characters to engage their intelligence now and again.